Introducción: Las enterobacterias del genero Erwinia spp producen enfermedades en la papa, un tubérculo de consumo masivo. La regulación de la metilación del DNA puede regular la proliferación de la Erwinia, de tal modo que las concentraciones del ácido fólico, pueden tener un efecto en la capacidad patógena del microorganismo. De otra parte, el ácido fólico previene la aparición de defectos del tubo neural en humanos. Objetivo: Evaluar al ácido fólico como un agente bacteriostático de la Erwinia y que a su vez sea parte de la fortificación de alimentos de consumo masivo como la papa. Materiales y métodos: Se llevó a cabo la caracterización bioquímica de la Erwinia chrysanthemi, se estudió su crecimiento frente a diferentes concentraciones de ácido fólico Resultados: Al aumentar las concentraciones de la vitamina, desde 0,3 µg/L hasta 6,8 µg/L se inhibe el crecimiento bacteriano de la Erwinia chrysanthemi. La vitamina inhibe el crecimiento en cultivo de Erwinia chrysanthemi y actúa como agente bacteriostático, aspecto de gran relevancia dado que teóricamente, si la papa estuviera fortificada con el micronutriente, este actuaría contra el agente infeccioso y al mismo tiempo contribuiría al consumo adecuado de la vitamina en la población general. Profesora asociada. Bacteriología Especial Grupo de Enfermedades Infecciosas. Profesor asistente Instituto de Genética Humana. Facultad de Medicina. Pontifica Universidad Javeriana. Servicio de Genética. Hospital Universitario San Ignacio. Potato Genome Sequencing C, Xu X, Pan S, Cheng S, Zhang B, Mu D, et al. Genome sequence and analysis of the tuber crop potato. Nature. 2011 Jul 14;475(7355):189-95. Superintendencia, Industria y comercio. Cadena productiva de la papa: diagnóstico de libre competencia. 2013 [consultado 2015 Octubre 24]; Disponible en: http://www.sic.gov.co/drupal/sites/default/files/files/PAPA.pdf. Food and agriculture organization of the United Nations. Statistic Division. FAOSTAT. 2015 [consultado 2015 Octubre 24]; Disponible en: http://faostat3.fao.org/browse/Q/QC/E. Franco Y, Stefanova M, Coronado M. Patogenicidad y Virulencia de asilamiento de Erwinia sp. en semillas de papa importada. Fitosanidad. 2004;8(4):45-7. Duarte V, de Boer SH, Ward LJ, de Oliveira AM. Characterization of atypical Erwinia carotovora strains causing blackleg of potato in Brazil. J Appl Microbiol. 2004;96(3):535-45. Rocha-Gracia R, Lozano-Zarain P, Martínez-Laguna Y. Movilidad Bacteriana como un mecanismo de patogenicidad. In: Rocha-Gracia R, Lozano-Zarain P, Martínez-Laguna Y, editors. Mecanismos de patogenicidad e interacción parásito-hospedero II. Puebla: Bénemerita Universidad Autónoma de Puebla; 2006. Huang HE, Ger MJ, Chen CY, Pandey AK, Yip MK, Chou HW, et al. Disease resistance to bacterial pathogens affected by the amount of ferredoxin-I protein in plants. Mol Plant Pathol. 2007; Jan;8(1):129-37. Nissen J, Carrión J, Ciampi L, Costa M, Fuentes R, Schöbitz R. Biocontrol of Erwinia sp on calla (Zantedeschia sp). Agro Sur. 2008;36(2):59-70. Acimovic SG, Zeng Q, McGhee GC, Sundin GW, Wise JC. Control of fire blight (Erwinia amylovora) on apple trees with trunk-injected plant resistance inducers and antibiotics and assessment of induction of pathogenesis-related protein genes. Front Plant Sci. 2015;6:16. Borges AA, Sandalio LM. Induced resistance for plant defense. Frontiers in plant science. 2015;6:109. Ramegowda V, Senthil-Kumar M. The interactive effects of simultaneous biotic and abiotic stresses on plants: Mechanistic understanding from drought and pathogen combination. Journal of Plant Physiology. 2015;176:47-54. Aranega-Bou P, de la OLM, Finiti I, Garcia-Agustin P, Gonzalez-Bosch C. Priming of plant resistance by natural compounds. Hexanoic acid as a model. Frontiers in plant science. 2014;5:488. Heusipp G, Falker S, Schmidt MA. DNA adenine methylation and bacterial pathogenesis. Int J Med Microbiol. 2007; Feb;297(1):1-7. Crider KS, Yang TP, Berry RJ, Bailey LB. Folate and DNA methylation: a review of molecular mechanisms and the evidence for folate's role. Adv Nutr. 2012 Jan;3(1):21-38. Song GC, Choi HK, Ryu CM. The folate precursor para-aminobenzoic acid elicits induced resistance against Cucumber mosaic virus and Xanthomonas axonopodis. Ann Bot. 2013;111(5):925-34. Crider KS, Yang TP, Berry RJ, Bailey LB. Folate and DNA methylation: a review of molecular mechanisms and the evidence for folate's role. Adv Nutr. 2012;3(1):21-38. Balaghi M, Wagner C. DNA methylation in folate deficiency: use of CpG methylase. Biochem Biophys Res Commun. 1993;193(3):1184-90. Collier J, McAdams HH, Shapiro L. A DNA methylation ratchet governs progression through a bacterial cell cycle. Proc Natl Acad Sci U S A. 2007;104(43):17111-6. Anderson OS, Sant KE, Dolinoy DC. Nutrition and epigenetics: an interplay of dietary methyl donors, one-carbon metabolism and DNA methylation. J Nutr Biochem. 2012 Aug;23(8):853-9. Koike H, Takahashi M, Ohyama K, Hashimoto R, Kawagashira Y, Iijima M, et al. Clinicopathologic features of folate-deficiency neuropathy. Neurology. 2015;84(10):1026-33. Wilson RD, Genetics C, Wilson RD, Audibert F, Brock JA, Carroll J, et al. Pre-conception Folic Acid and Multivitamin Supplementation for the Primary and Secondary Prevention of Neural Tube Defects and Other Folic Acid-Sensitive Congenital Anomalies. J Obstet Gynaecol Can. 2015 Jun;37(6):534-52. Profamilia. Encuesta Nacional de Demografía y Salud; 2010. Prada G, Soto A, Herrán O. Consumo de leguminosas en el departamento de Santander. Colombia. 2000-2003. Archivos latinoamericanos de Nutrición. 2005;55(1):64-70. 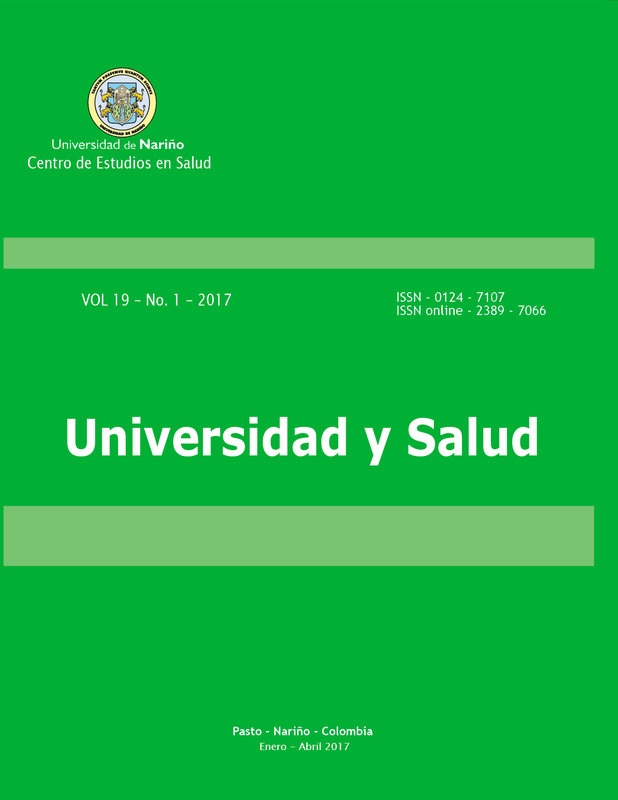 Ordoñez A, Suárez-Obando F. Exploración sobre los conocimientos del ácido fólico y sus beneficios en la salud reproductiva en una población universitaria colombiana. Revista Colombiana de Obstetricia y Ginecología. 2006;57(4):271-8. Castilla EE, Orioli IM, Lopez-Camelo JS, Dutra Mda G, Nazer-Herrera J, Latin American Collaborative Study of Congenital M. Preliminary data on changes in neural tube defect prevalence rates after folic acid fortification in South America. Am J Med Genet A. 2003;123A(2):123-8. Goyer A, Sweek K. Genetic diversity of thiamin and folate in primitive cultivated and wild potato (Solanum) species. J Agric Food Chem. 2011;59(24):13072-80. Moh A, Massart S, Lahlali R, Jijakli M. Predictive modelling of the combined effect of temperature and water activity on the in vitro growth of Erwinia spp. Biotechnology Agronomy Society Enviromental. 2011;15(3):379-86. Kunstmann J, Ciampi L, Böhm L, Barrera S, Collado L. Determinación de especies de Erwinia (grupo carotovora) como agentes causales de pudrición blanda. Agricultura Técnica. 2006;66(3):247-55. Kawaguti HY, Harumi Sato H. Effect of concentration and substrate flow rate on isomaltulose production from sucrose by Erwinia sp. cells immobilized in calcium-alginate using packed bed reactor. Appl Biochem Biotechnol. 2010;162(1):89-102. BSAC. British Society for Antimicrobial Chemotherapy. Methods for Antimicrobial Susceptibility Testing. Londres: BSAC; 2013. Rhim S, VoÈlksch B, Gardan L, Paulin J, Langlotz C, Kim W. Erwinia pyrifoliae, an Erwinia species different from Erwinia amylovora, causes a necrotic disease of Asian. Plant Pathology. 1999;48:514-20. Kado C. Erwinia and Related Genera. In: Dworkin M, Falkow S, Rosenberg E, Schleifer K-H, Stackebrandt E, editors. The Prokaryotes: Springer New York; 2006. p. 443-50. Yishay M, Burdman S, Valverde A, Luzzatto T, Ophir R, Yedidia I. Differential pathogenicity and genetic diversity among Pectobacterium carotovorum ssp. carotovorum isolates from monocot and dicot hosts support early genomic divergence within this taxon. Environ Microbiol. 2008;10(10):2746-59. Toth IK, Avrova AO, Hyman LJ. Rapid identification and differentiation of the soft rot erwinias by 16S-23S intergenic transcribed spacer-PCR and restriction fragment length polymorphism analyses. Appl Environ Microbiol. 2001;67(9):4070-6. Li J, Jin Z, Yu B. Isolation and characterization of aniline degradation slightly halophilic bacterium, Erwinia sp. Strain HSA 6. Microbiol Res. 2010;165(5):418-26. Shorten PR, Membre JM, Pleasants AB, Kubaczka M, Soboleva TK. Partitioning of the variance in the growth parameters of Erwinia carotovora on vegetable products. Int J Food Microbiol. 2004;93(2):195-208. Yahiaoui-Zaidi R, Jouan B, Andrivon D. Biochemical and molecular diversity among Erwinia isolates from potato in Algeria. Plant Pathology. 2003;52(1):28-40. Leporq B, Deremaux L, Demeurisse V, Kubaczka M, Dubois J, Membré J. Validation of predictive models in dynamic conditions: Microbial proliferation of Erwinia carotovora spp carotovora at low changing temperatures. Acta Horticulturae. 2001;566:137-42. Shane B. Folate status assessment history: implications for measurement of biomarkers in NHANES. Am J Clin Nutr. 2011;94(1):337S-42S. Sandoval J, Esteller M. Cancer epigenomics: beyond genomics. Curr Opin Genet Dev. 2012;22(1):50-5. Swayne BG, Kawata A, Behan NA, Williams A, Wade MG, Macfarlane AJ, et al. Investigating the effects of dietary folic acid on sperm count, DNA damage and mutation in Balb/c mice. Mutat Res. 2012;737(1-2):1-7. Bhakkad A. Inactivation of E. coli in the presence of folic acid and pterin-6-carboxylic acid as photosensitizers. Ann Arbor: Lamar University - Beaumont; 2009. Pufulete M, Al-Ghnaniem R, Khushal A, Appleby P, Harris N, Gout S, et al. Effect of folic acid supplementation on genomic DNA methylation in patients with colorectal adenoma. Gut. 2005;54(5):648-53. Mathers JC. Reversal of DNA hypomethylation by folic acid supplements: possible role in colorectal cancer prevention. Gut. 2005;54(5):579-81. Siu MK, Kong DS, Chan HY, Wong ES, Ip PP, Jiang L, et al. Paradoxical impact of two folate receptors, FRalpha and RFC, in ovarian cancer: effect on cell proliferation, invasion and clinical outcome. PLoS One. 2012;7(11):e47201. Schmidt FR. Optimization and scale up of industrial fermentation processes. Appl Microbiol Biotechnol. 2005;68(4):425-35. Deantonio C, Sedini V, Cesaro P, Quasso F, Cotella D, Persichetti F, et al. An Air-Well sparging minifermenter system for high-throughput protein production. Microb Cell Fact. 2014;13:132. Bogan JA, Helmstetter CE. DNA sequestration and transcription in the oriC region of Escherichia coli. Mol Microbiol. 1997;26(5):889-96. Casadesus J, Low D. Epigenetic gene regulation in the bacterial world. Microbiol Mol Biol Rev. 2006;70(3):830-56. Dathe A, Timlin D, Fisher J, Reddy V. Modeling potato root growth and water uptake under water stress conditions. Agricultural and Forest Meteorology. 2014;194:37-49. Blancquaert D, Storozhenko S, Van Daele J, Stove C, Visser RG, Lambert W, et al. Enhancing pterin and para-aminobenzoate content is not sufficient to successfully biofortify potato tubers and Arabidopsis thaliana plants with folate. J Exp Bot. [Research Support, Non-U.S. Gov't]. 2013;64(12):3899-909. Goyer A, Sweek K. Genetic diversity of thiamin and folate in primitive cultivated and wild potato (Solanum) species. Journal of agricultural and food chemistry. [Research Support, Non-U.S. Gov't]. 2011;59(24):13072-80. Robinson BR, Sathuvalli V, Bamberg J, Goyer A. Exploring Folate Diversity in Wild and Primitive Potatoes for Modern Crop Improvement. Genes (Basel). 2015;6(4):1300-14.